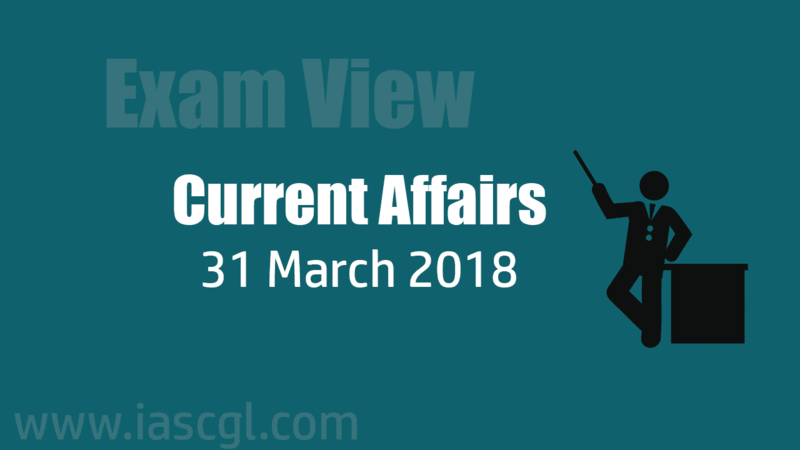 Current Affair of 31 March 2018, Exam View. Assam chief minister Sarbananda Sonowal launched a toll-free helpline number 181-Sakhi for women, amid a spurt in crimes against women in the state. The 181-Sakhi toll-free women helpline is a scheme of universalisation of women helpline launched under the Ministry of Women and Child Development, Government of India. The last PIC meeting was held in Islamabad in March 2017, a significant move at the time as it came after the “surgical strikes” by India across the Line of Control, and the government’s announcement that it would reconsider its position on the 1960 treaty with Pakistan after terrorist attacks in Uri. The Indus water treaty covers the water distribution and sharing rights of six rivers—Beas, Ravi, Sutlej, Indus, Chenab and Jhelum. Madhya Pradesh has won the Geographical Indication (GI) tag for Kadaknath, a black-feathered chicken known for its flavourful meat and found mainly in the tribal district of Jhabua. Nasa is all set to send the first-ever mission dedicated to exploring the deep interior of Mars, scheduled to launch on 5 May. InSight - a stationary lander - will also be the first NASA mission since the Apollo moon landings to place a seismometer, a device that measures quakes, on the soil of another planet. As per an interstate Yamuna water-sharing agreement in 1994, 1917 cusec water was allotted to Rajasthan from Tajewala headworks but there was no consensus on how the water could be brought to the state. Now water will be supplied through a pipeline and the Centre will provide financial assistance for the same. India's Geosynchronous Satellite Launch Vehicle (GSLV-F08) successfully launched GSAT-6A Satellite into Geosynchronous Transfer Orbit (GTO). It is a communication satellite built by ISRO to provide mobile communication services through multibeam coverage. A geosynchronous orbit is a high Earth orbit that allows satellites to match Earth's rotation. A spacecraft is first launched into an elliptical orbit called Geosynchronous Transfer Orbit (GTO) to attain geosynchronous (and also geostationary) Earth orbits later. It is equipped with S and C band transponders. A transponder is a device that receives and transmits radio signals at a prescribed frequency range. The Transiting Exoplanet Survey Satellite (TESS) is an Explorer-class planet finder by NASA. The spacecraft will be launched aboard a SpaceX Falcon 9 rocket from Cape Canaveral Air Force Station in Florida. The government has also decided to retain a 24% stake in this entity after the divestment .